For me this was a year of high activity with some significant "firsts", and no flights on the coast recorded. At the end of April, my first major XC of the year (from a winch launch too, it must be said) took me diagonally across East Anglia in a light northwesterly wind, with clear blue skies initially. 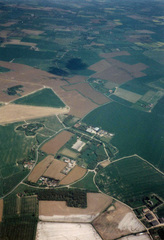 After tracking over Wymondham, Hethel (Snetterton), near Tibenham (sailplanes), I saw Metfield in the distance. 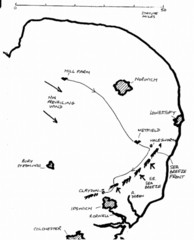 Metfield was by this time frequently used by SCFHGC for winching with their Koch winch. To fly overhead at 4500' and see them on the ground was an enormously headswelling - if somewhat unsympathetic - reaction. I think the kites were at the right hand apex of the airfield, being winched up into what was still a light north westerly wind. My track was from left to right in this picture - and do you see those two cloud shadows in the middle distance? They were my clouds! 'On raising my eyes to the coast I immediately realised that I was facing a perfectly unmistakable classical sea breeze front …' I wrote in an article published in SkyWings magazine a month or two later. This was illustrated with satellite pictures of the cloudcover over East Anglia, and diagrams of the clouds and massive air movements involved as cold dense sea air flows across the coast and underneath the prevailing light northwesterly warmer air. Flying in the sea breeze convergence zone was not a picnic, but to fly through it towards the coast would have brought me down very quickly in the non thermic sea air. Flying along it was the only option, but it was extremely turbulent, confusing and exhausting. I landed eventually in a field near Ipswich suffering the usual mixture of fatigue and dehydration - the brain doesn't function too well in those conditions. As I de-rigged the kite, facing the unknowable prospects of a 40 mile retrieve, a car drew up. Anthony Shaw of SCFHGC said hullo! He lived in Claydon, a few minutes walk away. Later, after many cups of sweet tea to restore my hydration balance, I was rescued by Paul Welton who brought my car from the field in Norfolk to collect me. Such was the occasional good fortune and generosity that one encountered during these adventures. There was lots of activity throughout East Anglia during those summer weekends. Wishing to share our successes and failures, I would phone around after the weekend to gather stories. 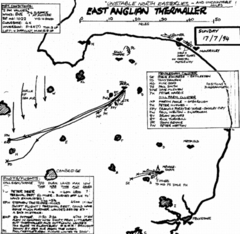 The 'East Anglian Thermaller' sheet evolved from this. Here is one issue illustrating the achievements of a Sunday in July when unstable northeasterly winds - the best possible forecast for us - actually materialised. You can see that despite the NE forecast, not everybody went to Cromer or Mundesley, although there was considerable traffic on the 'coastal motorway'. North Norfolk Hang Gliding Club were operating their winches at Sculthorpe, which had been regained as a flying site once more, and was favored by those fiscal refugees who couldn't afford the Hill Farm scene. Phil had some thermal flying but couldn't get above 2000' - probably a result of being much closer to the coast. SCFHGC were operating their winches at Mendlesham and had a good crop of modest XC's, but once again the proximity of the sea was probably a limiting influence. Hill Farm had a very successful time with both aerotow and winch launching contributing, and quite likely benefitted from the sea air having travelled further inland. Peter Deer did best. Stephen and I bungled badly: we landed just inside the Air Traffic Zone of the big USAF airbase at Alconbury - 'Nul points!'. 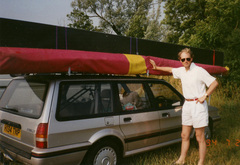 Stephen was flying his new Swift and could have gone hundreds of miles. Ooh dear! If this picture exaggerates the advantages of Hill Farm, then in fairness I should show the August Bank Holiday weekend picture. SCFHGC regularly did an annual hang gliding demonstration and promotion event at Banham Zoo. This year the weather was good – every day. 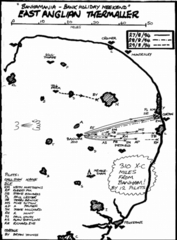 By contrast the flights from Hill Farm were minimal but that was largely influenced by the fact that the more active XC pilots had gone to Spain … for the League. The posy picture of me and my Kiss ('What? Again?' …) is included not primarily for me, but for the Swift. Do you see that elegant form just behind me on the Hill Farm field? It was an incredibly sleek fibreglass flying wing designed for foot launching, but with joystick control rather than weight shift. The pilot sat reclining in a cage beneath the centre of the wing. Perhaps inspired by Tony’s earlier efforts with the Fledge, Stephen had set his sights a bit higher. News of the new Swift design came across the Atlantic. Potentially it had about twice the flying performance of the best conventional flexwing hang gliders. like a box to put it all in, then you needed a vehicle to carry it on without too great an illegal overhang, and then you probably needed a driver, and of course in the first place you needed the £10,000 or so to purchase it. Was I envious? … heck, yes just a little bit, but only for the mouth-wateringly aerodynamic wing, you understand, and after all, the additional weight would have been too much (for me) - even thinking about it made my back hurt. In the picture you can see Stephen himself, of course, and from the ground upwards, the 'Swiftmobile', Stephen’s flexwing (red) and the Swift box (?green). I will treat myself to another non-East Anglian picture, which also has the virtue of showing the Swift much better. By now Stephen had fitted fairings to the pilot’s cage, improving its performance even more. 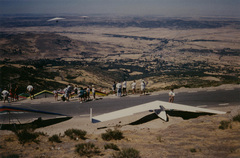 This view was from the Peña Negra take-off at Piedrahita, a much acclaimed site for cross country gliding potential in central Spain. Long mountain chains stretching west and north of Madrid through Avila and Segovia seemed to have an admirable propensity for creating convergent air zones hundreds of miles long. This was a magnetic prospect for the (British) League (nowadays called the National Championships) who would hold at least one comp a year on foreign soil. 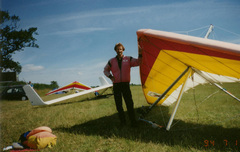 The League comps comprised the League pilots (the top 50 hang glider pilots in the UK) plus various invited high class foreign pilots. So what the heck were we doing there? Well, on account of our increasingly higher scores in the National XC league, we had been invited as guest pilots! Modest fame at last. In addition to Stephen and myself, the other East Anglian pilots so recognised were (I think) David Drake, Gary Aldous, Peter Deer, and Malcolm Stoodley. The weather was good. The tasks set were at international competition level, and tough. The top pilots were turning in amazing performances. On the penultimate day, conditions looked particularly promising so a race to goal at Arcones was set. Arcones was … a mere 154 km away (96 miles). Thirty four pilots out of about 100 got to goal! Stephen arrived first (or fastest – I’m not quite sure which). I arrived in goal last, or nearly last, and almost totally out of my mind with dehydration and exertion after 4½ hours of flight. All that was then needed was for our retrieve driver (Francis Forsythe-Yorke on this trip) to drive 100 miles from Piedrahita in Stephen’s Swiftmobile to collect us, and then to drive 100 miles back again (picking up David Drake and Garry Aldous on the way, I think) whilst we argued about where to eat on the way back. The next morning – the last day of the comp – we mustered at the Peña Negra launch for a final time, hoping for equally great achievements. Stephen got to goal first again (a not-so-distant goal for this last day). He did it so quickly that he arrived there before the marshalls and couldn’t see any goal indicators on the ground, so he flew off elsewhere for another half hour until they arrived. I bombed out in 'The Pass' - a notorious bottleneck in the mountains just 6 miles from take-off - and was so mortified and deflated by this performance after the jubilation of the previous day that I remained miserable about it for weeks afterwards. The highs and the lows of hang gliding you could say. Plenty of room for an improvement in ego-management too, I guess.